Addressing shareholders recently, Warren Buffet defended 3G Capital’s method of cutting costs and shoring up short-term profits. The comments came in the aftermath of 3G’s $143 billion failed bid for Unilever. It is worth examining the two models of capitalism that 3G and Unilever represent. 3G’s last success was with Kraft Heinz. Kraft Heinz today is notable for its clock-like efficiency. The company has closed many of its plants, sold off non-productive assets and has waged war on costs. Fortune magazine has reported that the company has been able to shrink overhead costs from 18% to 11% in two years. 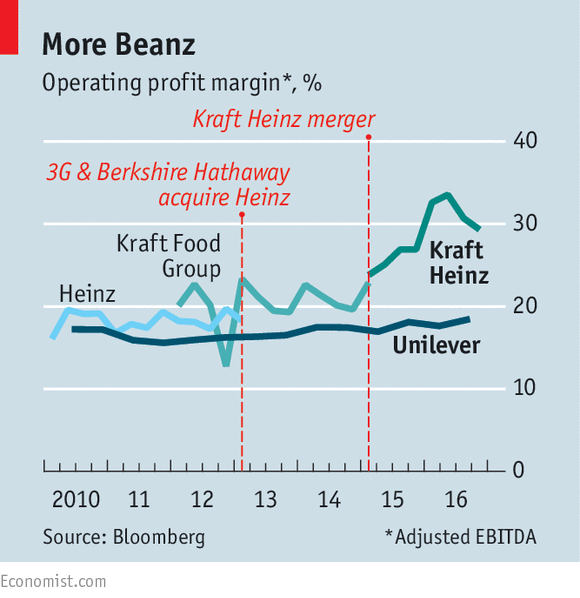 As noted by Professor Julian Birkinshaw of London Business School, the executives at Kraft Heinz (mostly planted by 3G) have transplanted the performance culture of an investment bank to the world of fast-moving consumer goods. The culture transformation is nothing short of breathtaking. If you perform well, rewards and bonuses await you. If you are sloppy, you lose your job. Period. There is no scope for emotions or empathy. 3G’s overarching mission is the maximization of shareholder wealth. Although not explicitly stated, but evident from its actions, other stakeholders simply do not matter. It is possible to argue that 3G’s approach is perfectly consistent with the core principles of capitalism. After all, “Capitalism demands the best of every man – his rationality – and rewards him accordingly. It leaves every man to choose the work he likes, to specialize in it, to trade his product for the products of others, and to go as far on the road of achievement as his ability and ambition will carry him.” (Ayn Rand: Capitalism: The Unknown Ideal, PP20). Unilever is at the other end of the spectrum. Unilever’s mission is to “make sustainable living commonplace.” Paul Polman is at the forefront of “pro-social” goals and wants to double Unilever’s revenues while reducing its environmental footprint and increasing social impact. Unilever extolls performance but in a much more nuanced way. Integrity and impact mean a lot more than hard numbers. Unilever’s executives may not earn as much as their counterparts at Kraft Heinz, but they do have a more relaxed work setting, devoid of relentless pressure to deliver quarterly results. We have these two companies, both in the consumer goods space, trying hard to push their brand of capitalism. 3G capital controls Kraft Heinz and has become a force to reckon with notwithstanding the fact that some of its methods are open to debate. Unilever has become the poster-company for “conscious capitalism.” When you think of corporate social responsibility, you cannot but think of Unilever. The notion that corporations exist to serve all stakeholders and not just shareholders is equally debatable. Jorge Paulo Lemann (3G) is not accustomed to failure. His strategy is simple – slash costs and merge. 3G’s ruthlessness emanates from the fact that thousands of workers have lost their jobs in the target companies. That does not seem to deter either Lemann or 3G. After all, investors are happy (at least in the short term) and should owners (shareholders) worry if people lose jobs in the process of wealth creation? This is one end of capitalism where inequalities will increase, jobs will be disrupted, and people who do not or cannot acquire new skills just won’t survive. The whole idea may make you squirm, but you cannot wish it away. After all, 3G represents what textbooks advocate and very few firms can pull off – managers who act like owners (and are rewarded accordingly). 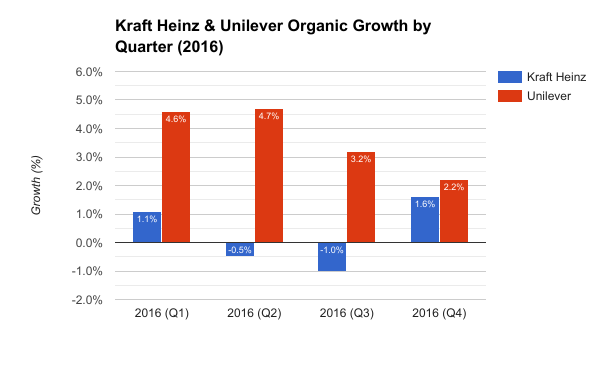 It is worth noting that Kraft Heinz’s sales have fallen in four of the six quarters since the two companies combined, placing a big question mark on whether cutting costs relentlessly is compatible with growth. Paul Polman of Unilever is one of the most ardent exemplars of responsible capitalism. In his worldview, products that meet the highest standards of social and environmental sustainability perform better than products that don’t. Polman’s assertion appears to hold in the long-term but not in the short term, as the graphs above and below show. At the heart of capitalism’s dilemma is the ultimate goal of the corporation. Agency theory suggests that managers are “agents” and hence “maximizing shareholder value” is the primary responsibility of managers. Come to think of it; shareholders have absolutely no incentives to think like owners. Therefore, the agency theory produces a moral hazard. Shareholders are not worried about the morality of decisions nor do they have a clearly defined responsibility as to the consequences. It is unrealistic to assume that all shareholders have a common purpose or an overarching vision. Managers feel constrained in their ability to perform due to the constant pressure from over-zealous shareholders. What is the way out? Which “brand” of capitalism do you espouse? Why?